We have known about the perils of climate change for more than two decades. But global efforts to slow it down by reducing greenhouse-gas emissions have largely failed. Even if we could stop producing greenhouse gases tomorrow, the high concentration of carbon dioxide already in the atmosphere will cause the climate to continue to change. As a result we must not only intensify our efforts to reduce climate change but start preparing for its inevitable effects. In this report, SPUR addresses how we should adapt to climate change in the Bay Area, including which tools and strategies will make us resilient to its most severe impacts, including drought, higher temperatures and sea level rise. We recommend more than 30 strategies for local and regional agencies to begin minimizing the region’s vulnerabilities to these long-term but potentially catastrophic effects. 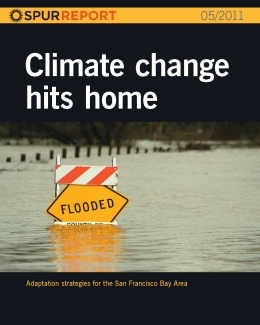 Download "Climate Change Hits Home"
The SPUR Board of Directors reviewed, debated and adopted this report as official policy on February 16, 2011. Climate Change Hits Home was made possible by the generous support of the San Francisco Foundation, the Richard and Rhoda Goldman Fund, and a Community Action Grant from the Urban Land Institute.